Three weeks later, however, the everpresent ache was really getting on my nerves. It wasn't excruciating, but it just never stopped. Advil and/or Tylenol weren't helping, and all too often I just wanted to curl up in bed while trying to find a less uncomfortable position. Even upgrading to Percocet wasn't as effective as I remembered. The opioid takes over an hour to kick in, typically helps for 90–120 minutes, and then fades away. Sometimes the relief is minimal. I made an appointment with my gastroenterologist to get a third opinion (after the radiation doc and my regular oncologist), and based on some x-rays she felt the pain was constipation due to intestinal blockage. This made some sense, as many of the meds I'm on now can cause constipation. Including—wait for it!—Percocet. Meaning if that diagnosis were correct, the painkiller I was taking to relieve the stomachache was actually causing the ache. Yet that diagnosis didn't last long. I cut way back on Percocet, guzzled some magnesium citrate, and suffered through a couple of miserable days… No change. On top of that, my radiation doc thought the pain was more likely to be caused by the stent itself. He had a week's worth of CT scans, of better quality than x-rays, not showing any blockage. 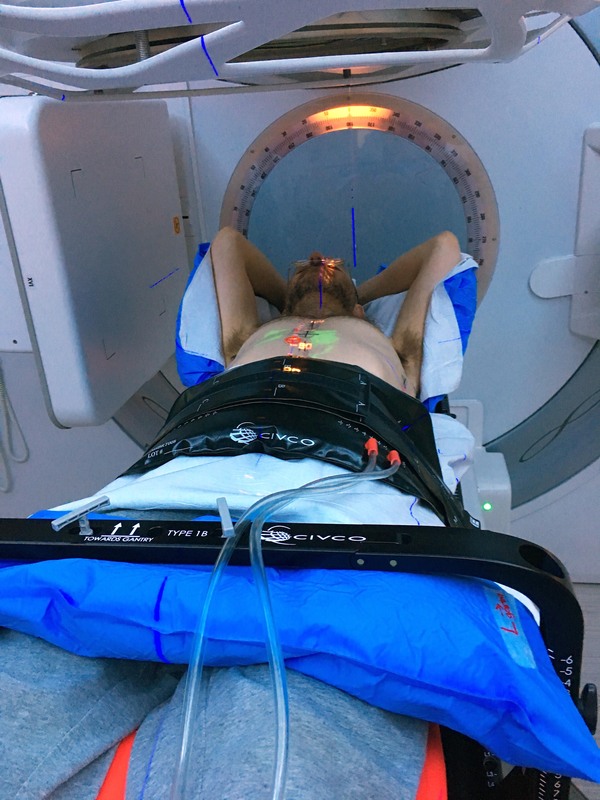 So, about that whole radiation treatment thing… As you can see from the pictures above and below, a big part of each session is making sure I am completely immobile. Many of the tissues surrounding the tumor are susceptible to damage from radiation, so the laser needs to be aimed precisely every time. 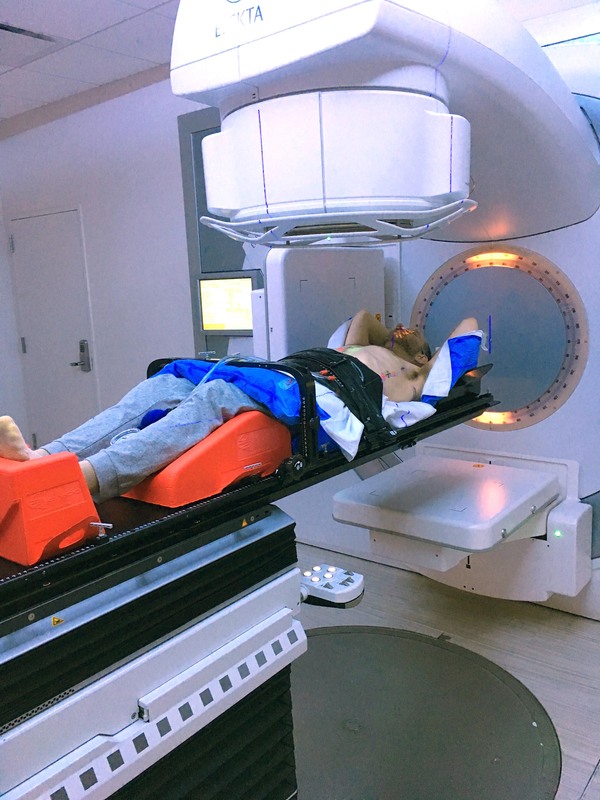 Two weeks before starting treatment, the team took a baseline CT scan. At the start of each session, they take a low-resolution scan to ensure everything is lined up in all three dimensions. The support cushion I'm lying on is actually a sort of vacuum-packed bean bag. At that baseline meeting, the cushion was molded around my back and arms. Once all the air is sucked out, the beans have nowhere to move and the cushion maintains its rigid shape. On top of that, my legs are buckled down and a kind of girdle holds my stomach in place. That last piece squeezes fairly tightly so there's as little movement as possible. Treating the abdomen is tricky, since it tends to move around with every breath. The team tracked my breathing during the baseline session, so there's some [literal] wiggle room, but the less the better. I'm covered in markings and stickers to help align everything correctly. The positioning is, in fact, the longest part of treatment. Once the team confirms that everything's in place, the actual radiation blast takes only about 5 minutes. It's every weekday for three weeks. 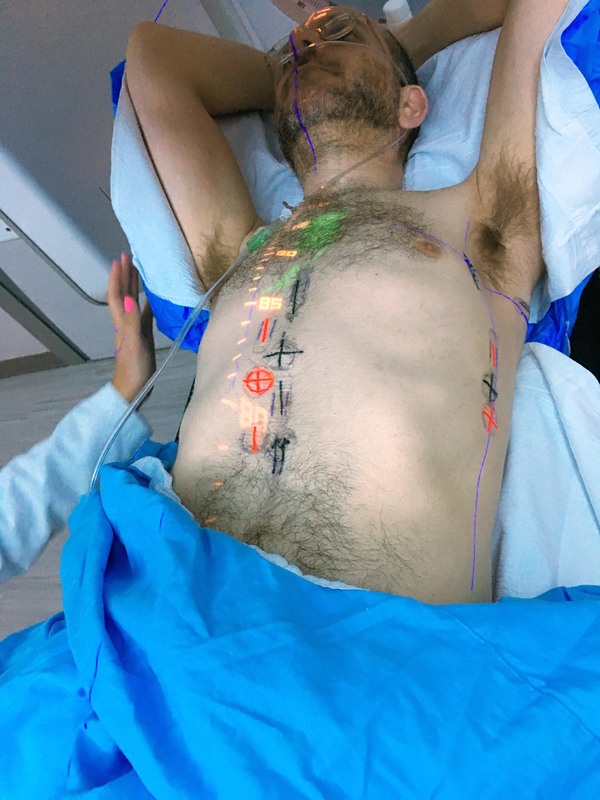 CyberKnife would have been a mere 5 days, but the critical thing about radiation is the cumulative dose—whether applied at high levels for a short time or low levels for a longer period is irrelevant. So that's where things stand. Once radiation ends in a week, we'll take some new high-resolution scans to see what effect the treatment had. That will determine next steps (more chemo?). And in two weeks, Anne and I will have a Shenandoah Getaway with a Plate List dinner from the Inn at Little Washington. Many, many thanks to my fabulous Westat colleagues for their sponsorship of this outing. You're the best!